Last Thursday, I went to a wonderful Christmas party put on by the women's organization in my church. We had dinner, a really nice musical program (I didn't know there were so many talented people in my congregation! ), and at the end of the night, they gave us these cute little nativities. It would be really easy to make one of these for yourself. And who wouldn't want one of these nativities to decorate their home? 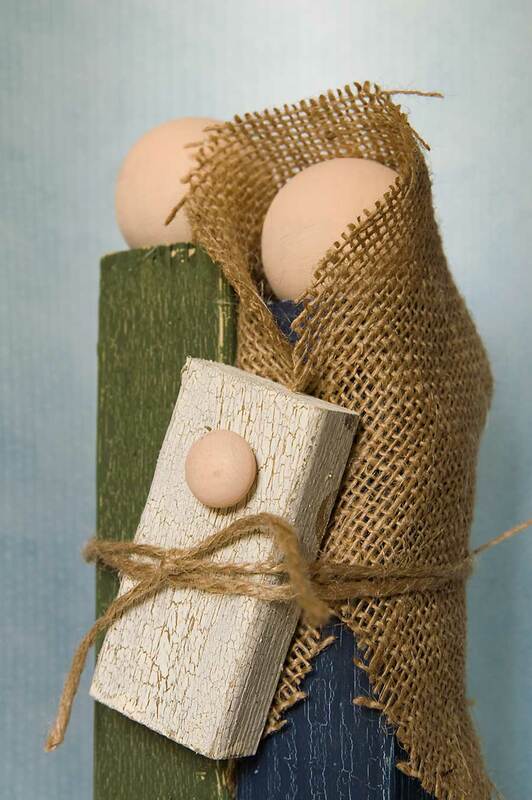 Three wooden knobs. Baby Jesus's head is about 3/4" diameter; I forgot to put that in the picture. UPDATE: I've gotten lots of questions about where I got the wood for this project. Like I said, I didn't make this nativity, but rather had it given to me at the end of this church activity. I'm guessing that they got the wood at Home Depot/Lowe's/etc. The process is pretty clear from the pictures, I think, so I won't write them out. Here's a picture of the back, though. 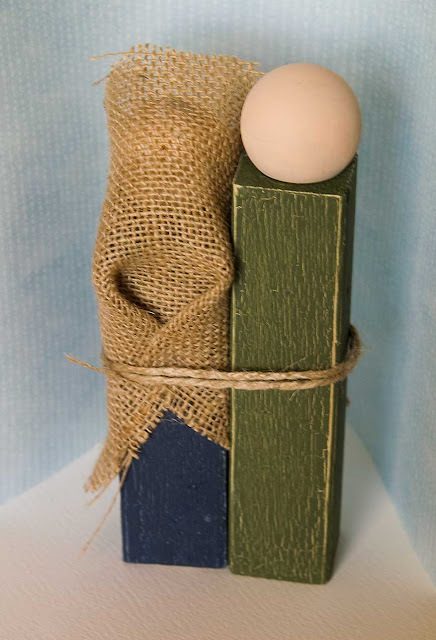 I love this craft idea...if I give your website credit, may I put it in our MOPS newsletter? I think it would be an excellent idea for moms to do with their preschoolers. Let me know! I LOVE this craft!! I am hoping to make it for Christmas gifts for my son's teachers at MDO. I am having trouble finding wooden blocks the correct size. Did you have to cut the boards yourself at Home Depot or is there a store somewhere that has blocks in these sizes? I tried Hobby Lobby and Michael's but I have been unsuccessful in finding the blocks. Any help would be greatly appreciated!!! I love simplicity, and these are just lovely. I am going to link to them on WeeFolkArt.com's FB page. Thanks for a lovely tutorial. 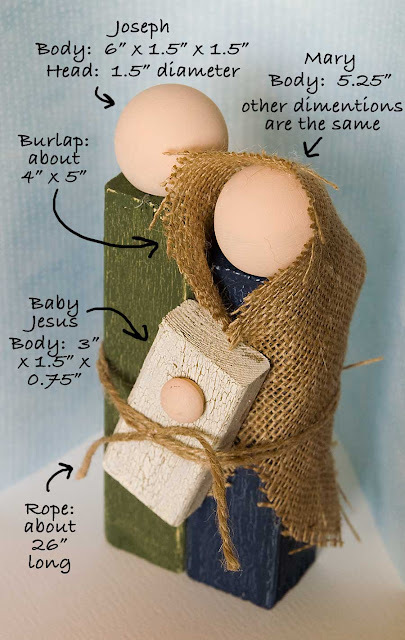 I wanted to let you know that I featured the wooden nativity family tutorial from your blog on mine today. I hope this was okay. I am a fairly new blogger and still learning how these things work! Please look at it and make sure I have given you credit as I should and you approve; I included a link back to your blog. Thanks so much for having such a great post and great blog! The kit was purchased from the Wood Connection in Murray! just fyi-i'm currently making this craft. i got what is called "2 X 2" wood from lowes--it's 8 feet long (it actually measures 1.5x1.5 but for some reason men call it 2 x 2...go figure), about $2. For baby jesus you can get the same thing but skinnier in the same aisle. an 8ft long plank is $0.98. cut it to the lengths you need and you have a really inexpensive project. the wooden balls i found at a local craft store called porters (my joanns/michaels/walmart were all out). they came 8 in a bag for $2.99 and measure 1 1/2 in. i found the head for jesus in the same area-came in a bag of like 20 for about the same price. Just at a glance ... I'm going to try it with extra Jenga pieces, a domino, buttons, and some scrap fabric. I just made this with 2 Jenga pieces, a small Lincoln log, 3 white buttons, and some scrap fabric. I'm looking for something simple my son could make out of things I have around the house. It looks pretty cute! I wish I knew how to upload a picture. Where did you buy the crackle paint? I looked at Jo-Ann Craft store but didn't see any. Do I need to go to a home improvement store? Thanks! The wood looks like those colored building blocks that have been around forever. A set of the colored wooden blocks at Walmart are a little over thirty dollars, but you could make a whole lot of these from one set and not have to worry about cutting and painting them.